Joseph and Regina welcome you to their Madikeri Misty Homestay. A perfect getaway. A place where you can unwind and feel at home. We are not offering you the luxury of hotels, the ambience where you are made to feel like a guest. However, we are inviting you to feel the culture, tradition and hospitality of Coorg, to give you a feeling of what it’s like to be a part of our family. 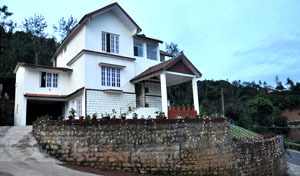 Our home is nested on a hill, surrounded by lush greenery and only 3 kms from Madikeri town. You will soon get used to going to bed with the sound of crickets and waking up to the chirping of birds, especially parrots. Traveling is all about meeting new people, the different experiences that bond people together and that is exactly what we are offering. An experience you will cherish! !